Final Fantasy VII did a lot of things, but one was revolutionising the idea of how a turn-based battle could look and feel. On the latest episode of Boundary Break, YouTuber Shesez shows what these scenes look like from the outside. The Boundary Break series has become renowned for taking control of in-game cameras and messing around with different layering effects to reveal the hidden parts of games players don't normally get to see. It's able to do this thanks to a tool set developed by Nekorun which makes it possible to break the game and explore it in a sort of all-seeing god mode. 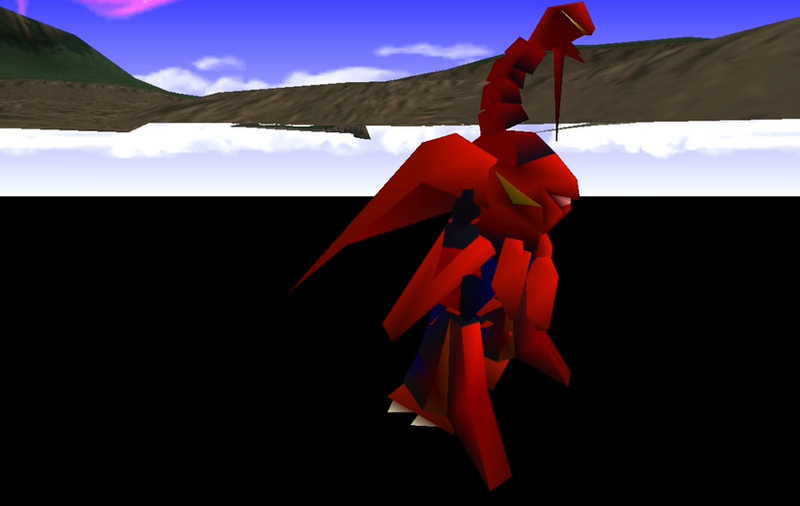 For Final Fantasy VII, that means showing the shape of the battlefields, how the different sky backgrounds wrap around them, as well as what's happening with characters like Ifrit and Bahamut when you summon them. 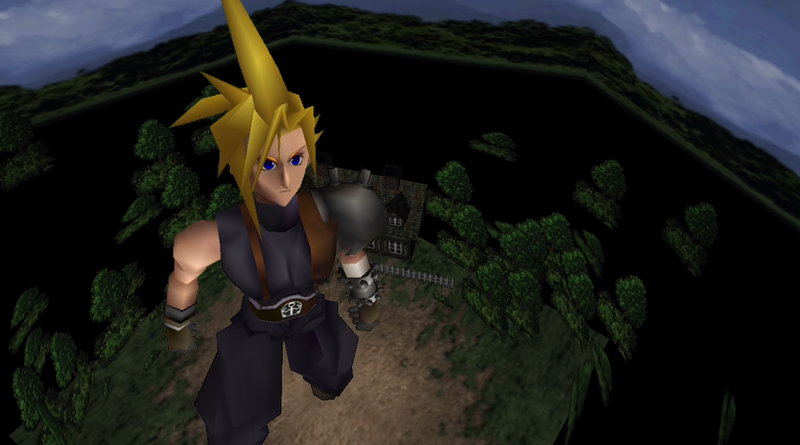 Shesez has taken on Chrono Trigger, Earthbound, and Mario RPG in past episodes, but the PS1-era polygonal graphics of Final Fantasy VII offer some new unique fodder for his methods. While he admits there's nothing groundbreaking behind the the game's virtual curtains, the video still provides a really interesting of looking at the game for those of us who have spent so much time playing and thinking about it. Take the Ruby Weapon for instance. One of the game's optional super bosses, it appears on the main over world map only as a small tendril sticking out of the desert around the Golden Saucer. It's not until you encounter him by taking a chocobo across the dunes that he'll hop out and fully reveal himself. Shesez is able to show what he looks like the rest of the time when he's just hanging out though. It makes perfect sense that he'd be sitting their fully-rendered just waiting for players to challenge him to a death match, but it's neat seeing that in action with the rest the backgrounds removed. It's especially weird to think of him just waiting their ready to go for a good chunk of the game. How many games has he spent rocking back and forth in video game purgatory while the player never showed up because, let's be honest, taking down an FFVII weapon requires being a special kind of fanatic. In addition to showing what lies behind some of the pre-rendered backgrounds and demonstrating different parts of the map the designers had clearly intended to use and allow the player to access at one point or another, Shesez spends a lot of time on the battle environments. It's cool to see Bahamut hovering in the air over the player during its summon animation in part because the game does such a good job of making everything in the battles feel like a choreographed cutscene. The camera's always moving, shifting angles and points of view in such a way that the shots come off like little film. In reality though, it's a camera moving around in real time showing the player whatever happens to be in view including character models, enemies, and various cone-shaped backgrounds that wrap around to contain all of them. 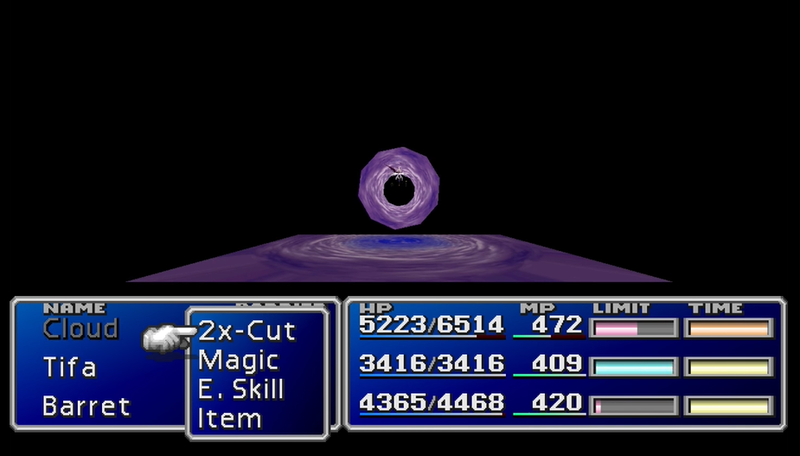 The effect comes through well in the final boss fight against Sephiroth. Two planes of swirling pink clouds are used to mask everything outside of the immediate battle, even though in reality there's game space that lies beyond it. I gotta say though, it's not ground breaking by today's standards, but it was a benchmark in its time for a reason. Technically I mean, not a rabid fan taking offence lol.